March 21 is the United Nations (UN) International Day of Forests. This day is aimed to raise awareness of the value of forests, their social and cultural functions that are so very important and not always observable, and to focus on problems that threaten forests, and therefore, the humanity. Forests cover almost one third of the land and are a source of a myriad of benefits. Let’s consider some of them. 1. Forests are a corner of unspoiled nature. Forests create unique ecosystems and are a home for 80% species of terrestrial animals and plants. The largest territories undisturbed by human presence, the so called Intact Forest Landscapes (IFL), are concentrated in Russia, Canada and Brazil. These are large forest areas with no roads, settlements and economic activities. IFL perform most important ecosystem functions to maintain regional water regimes and global climate conditions. These are the places where the nature is preserved in its almost original form, offering homes for animals, requiring large spaces to hunt and to live in comfortably, for example, for Siberian Tiger and Snow Leopard. 25% of Russian forests (255 million ha) are Intact Forest Landscapes. However, only a minor part of Russia’s IFL is afforded a high conservation status (as wildlife reserves or national parks). Today, the conservation of IFL in Russia is carried out through voluntary FSC certification. Other certification schemes do not provide for any IFL conservation. As of March 1, 2018, FSC-certified forests include approximately 3.4 million ha of IFL, 1.2 million ha of which are covered by voluntary commitments of conservation companies (strict conservation and buffer zones). 2. Forests are carbon storers and climate preservers. Forests are the second, after oceans, carbon reserve. Carbon stored in biomass, forest soil and forest products, accounts for around 10% of all projected carbon emissions for the first half of the current century. At the same time, 17% of anthropogenic carbon dioxide emissions are caused by deforestation and changes in the land-use system. 3. Forests are useful things for humanity. According to calculations, forests provide food and fuel, a place to live in, and a source of income for 1.6 billion people. Today 750 million people live in forests. Forested drainage basins account for three thirds of fresh water reserve used for agricultural, industrial, energy and urban water supply purposes. According to the estimation of the World’s Health Organization 65%-80% of people take forest-based medicines as a primary medication. Log harvesting, wood processing and pulp-and-paper industries account for around 1% of the Global GDP and offer the humanity such benefits as home, furniture, finishing and packing materials, natural rubber, paper, books, newspapers, copy books. 4. Forests make cities comfortable to live in. In 2018 the main theme of the International Forest Day is “Forests and Sustainable Cities”. Today, there are more people living in cities than ever in the history of the humanity. Thus, by 2050 urban citizens will account for 6 billion people. However, fast urbanization should not necessary mean increasing pollution of urban areas. Trees are natural air conditioners. Urban forests absorb hazardous substances from the air and resist climate change. Well planned urban tree planting helps lower summer temperatures of asphalt and buildings by 8°C in the shade, thus lessening the necessity to use indoor air conditioning by 30%. Trees separate residential buildings from roads and industrial areas, and reduce sound pollution. Forests strengthen slopes, help prevent landslides and protect residents of coastal areas from tsunami and storms. Forests are natural water accumulators. Residents of Bogota, Durban, Jakarta, Madrid, New York, Rio de Janeiro and many other large cities receive a considerable share of water from forested areas. By conserving and restoring drainage basins, we can save on construction of new water treatment facilities. By 2025, almost 1.8 billion people will live in areas with absolute water shortage which can be a problem for 2/3 of the world’s population. 5. Forests are heat and biofuel. Man has used fire for heating and cooking purposes for thousands of years. Even today, more than 3 billion people around the world heat their homes using firewood. Modern scientific developments offer extensive opportunities to convert wood into energy, such as conversion of wood waste into liquid bio fuel for auto vehicles and airplanes. According to the UN’s Secretary-General, sustainable usage of wood helps maintain the balance for future generations and guarantees that the wood will remain the fuel of the future. Nowadays, textile industry is in active production of some popular forest-based fabrics, i.e. viscose, viscose rayon and lyocell. As opposed to synthetic fabrics and cotton, these products offer the most environmentally sustainable solution, provided they originate from sustainable forests and plantations. (According to different data, from 15.000 up to 28.000 people annually die as a result of poisoning with pesticides used to grow cotton). Deforestation persists, but at slower rates. In spite of ecological, economic and social value of forests, global deforestation persists. According to the Evaluation of Forest Resources conducted by the UN’s Food and Agriculture Organization in 2015, forests cover about 30.6% of land (which is around 3.999 million ha). For comparison purposes, in 1990 the planet’s forested area made up 31.6% (4.128 million ha). These figures clearly demonstrate one of the major threats for the forest cover of our planet. Every year around 13 million ha of forests disappear from the face of the earth (7 million ha out of which are natural forests), while 50 million ha of forest land is affected by fires. This prevents sustainability both for people and the rest of the planet. Therefore, it is most important to take a sustainable approach to such a valuable, and, fortunately, renewable resource, as forest. 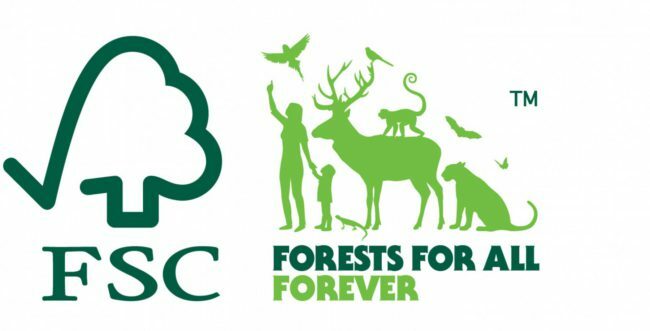 Forest Stewardship Council (FSC), promotes ecologically sustainable, socially advantageous and economically viable forest management around the world, in an effort to secure forests for everybody and forever.